Export of electricity is of economic and political importance for Ukraine, it contributes to the gradual integration of the Power System of Ukraine into the European Network of Transmission System Operators for Electricity (ENTSO-E), which allows for increasing energy security of the state. SFTC Ukrinterenergo has over 25 years of experience in electricity export market. Starting from 1993 SFTC Ukrinterenergo has exported more than 89 billion kWh of electricity to Hungary, Romania, Slovakia, Poland, Moldova, Belarus and the Russian Federation. The Company has experience of cooperation with both state-owned and private energy companies from Europe and CIS. SFTC UKRINTERENERGO has experience in operations of electricity import to the power system of Ukraine. Pursuant to decisions of the Government of Ukraine and the Ministry of Energy, with the purpose to support the balance in Ukrainian power system the Company provided import of electricity from the Power System of Russian Federation to the Unified Power System of Ukraine at various times. The volume of electricity imported by the Company over its history amounts to over 3 billion kilowatt-hours. 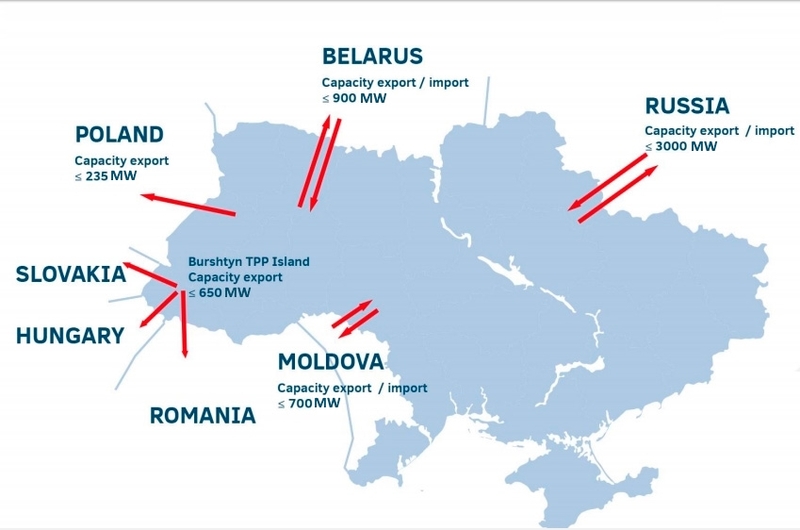 Under the conditions of Ukraine’s integration into the European Network of Transmission System Operators for Electricity (ENTSO-E) SFTC Ukrinterenergo provides electricity transit through power transmission lines of “Burshtyn TPP Island”. Starting from 2002 more than 4 bilion kWh of electricity have been transited through transmission lines of “Burshtyn TPP Island”. The Company’s partners in this type of activity are well-known European trading companies. 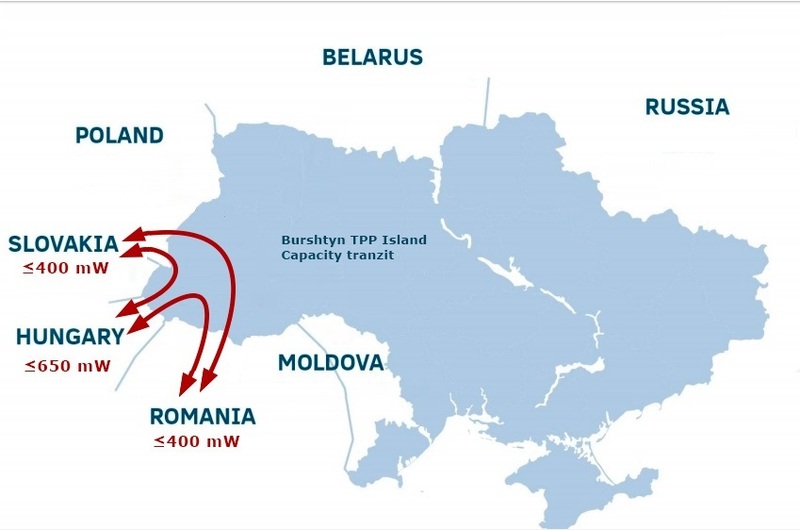 MAP OF ELECTRICITY TRANSIT THROUGH POWER TRANSMISSION LINES OF "BURSHTYN TPP ISLAND"
The Company has over 20 years’ experience in supply of natural gas and steam coal. During that period, the company has supplied almost 25 million tons of coal from Ukraine, Poland, South Africa and the Russian Federation for the needs of power generating companies of Ukraine. 284 million cubic metres of natural gas were delivered by SFTC Ukrinterenergo to Ukrainian power producers, as well as iron and steel enterprises. Reforms in the natural gas market of Ukraine offered SFTC Ukrinterenergo the possibility of trading in the natural gas market of Ukraine. In addition, the Сompany is able to provide wholesale supplies of furnace fuel oil M-100 (V-VI type, low-ash) of foreign production.